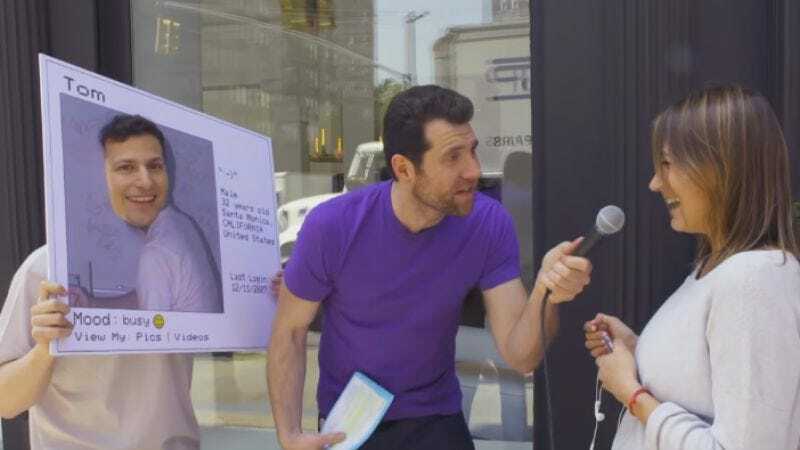 Billy Eichner just might love Hollywood more than anyone else on the planet, but now he’s decided to take a break from screaming at New Yorkers about celebrities to actually try and save the movie industry. To do that, he’s enlisted the help of Andy Samberg to pitch people on some new characters and brands that could be rebooted into big-budget action movies, which basically means that he’s screaming at New Yorkers about MySpace and the Starbucks mermaid instead of celebrities. Naturally, this is all done in the name of Eichner’s TruTV “game show” Billy On The Street, and in the above clip you can see Eichner and Samberg try to sell people on a grim and gritty Tom from MySpace, a live-action Gnomeo And Juliet, and a mature take on the DreamWorks kid. Jon Hamm and Lupita Nyong’o even show up to lend a hand, with Hamm as Doctor Strange, Medicine Woman and Nyong’o as an in-your-face NBC peacock. A new episode of Billy On The Street—one that includes this clip, presumably—will air on TruTV on Tuesday.